I went to see the Matisse exhibition at the Tate Modern the very first chance I could get, I was there one of the first weeks and the exhibition was simply breathtaking. So there was no doubt that I was going to quickly book a ticket for the Live at the Tate screening of behind the scenes at the Matisse exhibition. The film was shown last night simultaneously in cinemas across in the country, I caught it at the Showroom Cinema and it didn’t disappoint. There was music, dance, behind the scenes set up and short films about this late period in Matisse’s life as well as interviews with the curator and some of Matisse’s assistants and family. I found the film fascinating on so many levels, as an art history student, as a musician, as a dance fan and also as a previous gallery employee – all the familiar installation shots were there that fondly reminded me of hanging exhibitions at Museums Sheffield. The film was a great reminder of the exhibition, although there was obviously not enough time in the 90 minute film to show the 100+ works on display, but it was also a fascinating insight into the bigger picture of Matisse and his life and the people he inspired. I’ve already made up my mind that I am going to try and see the exhibition one more time before in closes in September. I, like many people, came away completely inspired by the works on display at the Tate and it reinvigorated my appreciation for works I haven’t really looked at since studying art at college, although what I had seen then was just a small number of the most famous works. It is of course amazing to see the work in person and I have had the privilege to see many of Matisse’s paintings over the years but never the cut outs. All of these years later though I see these cut outs in a new light. I’ve always been an appreciator of colour (although my obsession has grown ten fold in the last 8 years I’ve been printing) but this time I saw these cut outs under the influence of pattern too. I was struck by the clean forms and the patterns Matisse created with them, this is probably a side effect of seeing pattern in everything now which I find is both my curse and blessing, but seeing the Priest’s robes was something else. Here was a direct translation of a pattern designed for cloth. These robes were part of the project for the Chapel of the Rosary in Venice which Matisse designed, he created many works for the chapel including murals and stained glass windows. 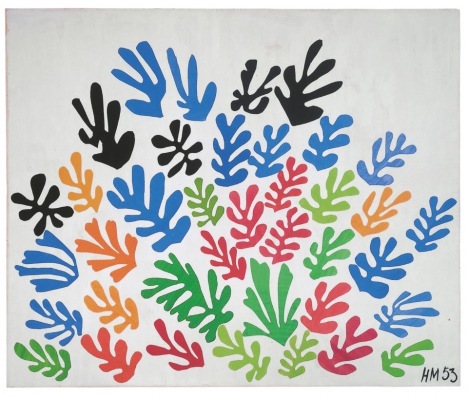 Matisse came from a textile town so patterns and textiles will have been a large part of his early life and it was easy to see that influence in the cut outs, especially in The Sheaf (1953) and Large Decoration with Masks (1953) where strong motifs are repeated. 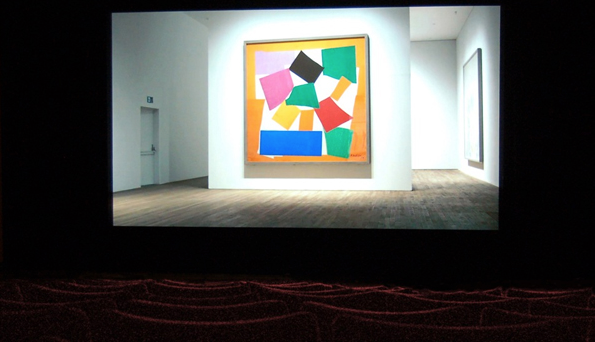 The film last night featured interviews with many writers and curators but one speech that stuck out was about how Matisse’s cut outs were both “decoration but also more than decoration”. The exhibition has already inspired me to get out my paint and scissors and employ Matisse’s cut out method to help with my own design and colour work, I hope it inspires you too. Here are some sneak peeks of the ballet and music sections of the film, I’ll replace these with the full versions if the Tate make them available.